Although there are several good reasons to upgrade to Windows 8, there are of course reasons why you should shun "upgrade" like the plague. Skeptical something new can be a healthy instincts, especially when it comes to new gadgets and new software. Yes, it can be fun to be first, but sometimes you may want to wait. Windows 8 is no exception, and we have several good reasons why you should be careful to jump over to the new OS. Just a simple thing to search for a file or a program seems like a much bigger affair when it gets blown up all over the screen. In Windows 7, you could do the whole process in the lower left corner of the screen. Perhaps the biggest reason why you should stick to what you already know, is because you already know how it works. To all the keys, you know where everything is, and you know what will happen when you press a button. With Windows 8, Microsoft will take more of the things we hold near and dear, and turn it on its head. Or remove it completely. The biggest change we're talking about here is of course the new Start screen, which we have previously referred to as the Metro interface. Microsoft has withdrawn the name, but the interface is still as intact as the first time it was shown. The new home screen has made many changes to the Microsoft operating system. Windows 8 is more touch-focused than its predecessor, the old start menu and start button is gone, and the operating system is split in two. Whether you have a touchable home screen in front of you, or do you sit with the traditional desktop on the screen - which has icons, taskbar and windows. This would have been fine, had just been able to choose. It can not, however, and suddenly you have to adapt to something new. New is not necessarily bad, but it is not entirely positive. Windows 8 should be regarded as the forgotten twin to Windows 7, not an upgrade. 2: Faster, but does it matter? Microsoft boasts of having an extremely fast start, and the time it takes to turn on a machine with Windows 8 installed should also be reduced for a few seconds. It is of course all well and good, but is that really what matters? Simply insert an SSD instead of a hard drive will shorten the startup time dramatically, and most with an SSD installed will probably argue that going down from 10 to 8 seconds in Windows 8 is not so very big role. So what we really care about, then? Performance, of course! Windows 8 is supposed to be an upgrade from Windows 7, so will our games are perceived as smoother and programs will go faster in the new OS? For example, in test programs such as 3D Mark 11 is Windows 7 better, and for tasks like file transfer and work in diverse applications, the two operating systems are quite similar. Microsoft is starting to get hard app contest with two very dangerous competitors. Google Store Google Play (formerly known as Android Market) has about 700,000 apps on offer, while Apple has the App Store with about the same number. With Windows 8 playing a new version of the Market Place, called Windows Marketplace. Currently, the store has about 2,000 applications to offer. No matter how big screen you want the content to be the same. On our 27-inch screen it appears reasonably poor use of space. It may seem cruel to compare Marketplace with Google Play and App Store, especially considering that Apple also has its own application store for Macs with a much smaller sample (in excess of 10 000 applications). The difference is that the Mac App Store offers full programs for the common desktop, while Windows Marketplace still only offer programs for the touch-friendly start menu. With Windows 8 will, after all, a move across the tablet in addition to traditional computers, and therefore tries to adapt its operating system to fit for both. The problem is that the app store is probably a feature of Windows 8 that is totally irrelevant to those who are sitting on a normal computer and using a mouse and keyboard. Had Microsoft allowed developers to add full programs for the common desktop had traditional PC users could at least use it for something. As it is now, only applications that can run on ARM platform supported, and it will apparently continue to be. Sure, Windows 8 may be cheaper than ever before. It does not so much when most things that are new concerns about touch-centric menus and applications for tablets. That means you need new hardware to get the most out of your operating system, and it costs money. If you plan to buy a Windows 8 tablet Windows 8 will probably be a fun experience. Equally fun is not for those who do not have a touch screen. 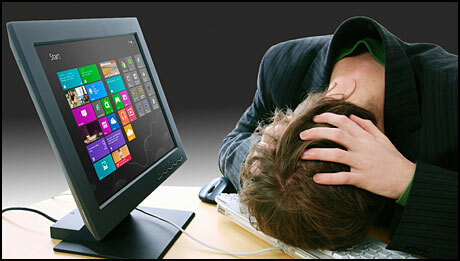 PC manufacturers are obvious and tripper in anticipation for Windows 8 launch. Each has prepared a number of new new models, almost all with a touch screen, to be able to satisfy what they hope will be an explosion of touchscreen horny consumers. For any plan to buy a new computer, it may be okay to wait until autumn explosion coming. A touch screen can, after all, do no harm. For those who do not want to buy new hardware to suit Windows 8 may not be the upgrade worthwhile. Although Windows 8 has been available to developers for one year and for everyone else since February, it is not flawless. Launches always tends to bring with it a bunch of small problems and errors that must be fixed, and this is hardly an exception. The biggest problem will probably frame the first group who ventures out on the touch screens. We have already witnessed the driver problems on a fresh installation of Windows 8 on a tablet, and considering how many different form factors, manufacturers and specifications to match the launch, it is not impossible to imagine that any problems will emerge. The smartest thing holding back the beginning and allows the more adventurous, take the first brunt. There you have therefore our top five reasons why you should stay away from Windows 8 As you may see, there is nothing in the way of you who are looking for a Windows 8 tablet, but you sit with a desktop PC with Windows 7, you should take a few rounds before you make your final choice. I used Windows 8 Developers’ Preview Edition, on VMWare, since it first appeared on the net. The retail version is probably more worked out. The first thing I found myself doing is get past the Metro interface to start using Windows 8. When past the Metro interface, Windows 8 looks a bit different than Windows 7 but doesn’t really work better. And the different bit is that one is trying to find all the icons and places to click, to find all the familiar stuff. It seems that MS developed an O.S. for Smart phones and tablets, with a touch screen, and then brought this O.S. out for PC as well. What can one possibly do with a Metro interface if one doesn’t have a touch screen monitor? And if one is using Photoshop or whatever, what is the purpose of a touch screen? I don’t want a touch screen, full of greasy fingers, in front of me. Why do I want to touch my screen when I spend so much time keeping it clean. If you have a look at all of the previous versions you will see that there is 1 good version and then one bad version, and this just repeats itself over and over again. I don't know about Win 1 or Win 2 as I never had them. Win 3.1 for WorkGroups was the Good version of Win 3. Win 7 is the Good version of Vista (the bad Version). So I feel that Win 8 is like Vista, just a Beta version that the Public Pay for the right to TEST it for MS and then tell MS what is wrong with it. MS then fixes all of the Bugs and Releases a new OS, which is really just the older Beta version with out the bugs. So according to my logic, Win 8 is going to be a Beta version which the public will pay for, just so they can TEST it for MS. Then MS will Release Win 9 which will be Win 8 with out the bugs. So i won't be buying or Install Win 8, unless I am Forced to. I am thinking of going over to a UNIX system, as the User Friendliness of the System is becoming more and more user friendly. And there are already so many FREE programs that can compete with MS head on and not lose a beat. Bring Back Windows XP, its still my favourite!